You'll visit kid-friendly attractions like Santa Claus Village and SantaPark - the Home Cavern of Santa Claus. And it doesn't end there: take an in-depth tour of Arktikum, experience the excitement of Feelapland, see the interesting displays at Christmas House Santa, and explore the fascinating underground world of Syvasenvaara Fell. 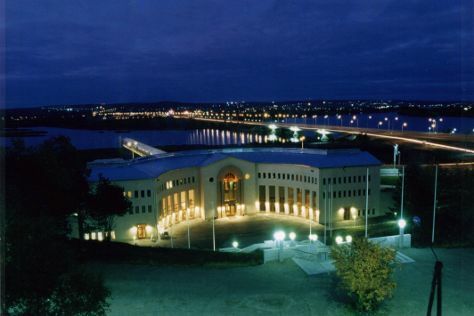 To find ratings, photos, more things to do, and tourist information, refer to the Rovaniemi day trip planning website . Philadelphia, USA to Rovaniemi is an approximately 16.5-hour combination of train and flight. You can also do a combination of train and flight; or do a combination of train, flight, taxi, and bus. The time zone difference moving from Eastern Standard Time to Eastern European Time is 7 hours. Traveling from Philadelphia in December, things will get colder in Rovaniemi: highs are around 22°F and lows about 11°F. Finish your sightseeing early on the 17th (Thu) so you can drive to Kittila. Kittilä is a municipality of Finland and a popular holiday resort.It is located in northern Finland north of the Arctic Circle within the Lapland region. Step out of Kittila with an excursion to Pallas-Yllastunturi National Park in Muonio--about 1h 05 min away. On the 18th (Fri), ski the day away in the pristine settings at Levi Ski Resort. The adventure continues: admire all the interesting features of Ice Karting Levi, get your game on at Kid's Land, and make a trip to Giewont Husky Adventures. To see maps, photos, and more tourist information, read our Kittila route app . Traveling by car from Rovaniemi to Kittila takes 2 hours. Alternatively, you can take a bus. December in Kittila sees daily highs of 23°F and lows of 9°F at night. Cap off your sightseeing on the 20th (Sun) early enough to travel back home.